A couple of people on Blonde have been talking about 45 to 180 man Sit and Gos, and how potentially profitable they are. I have been at something of a crossroad the last few weeks trying to find a game that I want to persue at the moment. I have decided that these tournaments could well suit me very well, so I am going to give them a shot over the next week or more. I've whacked a $1200 roll on PokerStars and am starting with the $11+1 turbo tournaments. 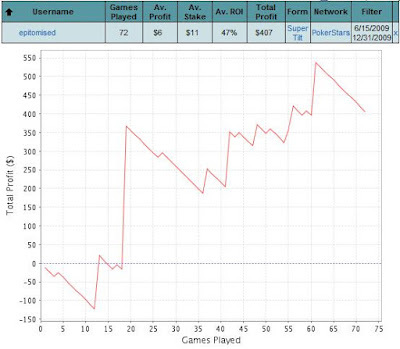 My first day of play, I managed to rack up 72 tournaments in under 5 hours of play as I was up-to13 tabling when I could, though the rate at which games got going usually meant I was playing 10 or 11 tables. It's a shame Hold 'em Manager HUD lags up my computer too much when playing this many tables, as I would be interested to know how close to EV I was running to give me a better perspective of my results. 3 Comments to "MTT SNG Experiment (Day 1)"
Get ready for variance city! Ye I've heard of people having some really sick sick swings in these. But from what I gather they are definately beatable, so good luck!